Really, it was only a matter of time before reality show contestants participated in a murder mystery-themed game. Not surprisingly the ‘penalty’ for failing to solve the case is murder. In “Whodunnit?”, thirteen guests arrive at Rue Manor where they are greeted by Giles, the butler, and two creepy, silent maids. When one of the guests is promptly murdered, the others are told they’ve been brought there to play a diabolical game. They must determine the howdunnit of each murder in order to avoid being eliminated themselves. Mind you I have no inside knowledge of who is or isn’t the killer, but crafting and plotting mysteries is a specialty of mine that I like to think I’m pretty good at. So after watching–and obsessing–over ABC’s summer mystery series, Whodunnit, I’ve come up with a theory. One I like to think is correct, but at the very least, I think it would be a great ending if it were true. To use a pun apropos of the ones the Butler Giles might use, I think I’ve nailed this one. At least, this is the solution I’d love to see and the one I would have written. So here is why I think the killer is … Ulysses! Yes, I know he’s been “killed off.” Or has he? He wouldn’t be the first killer to fake his own death to divert suspicion. In fact, consider this: everyone, but Ulysses, has died gruesomely and convincingly. The first victim, Sheri, was killed by a slingshot and electrocuted postmortem. Dontae was immolated. Adrianna blown up. Don was gassed, then mauled by a mountain lion. Skipping over Ulysses for now, both Dana and Sasha were chloroformed and had their blood drained to be posed like waxworks. Geno was shot and had a chandelier fall on him, and finally–so far–Ronnie, the latest victim, appears to have been blown out of a hot tub and somehow frozen with nitrogen. All brutal deaths. In the episode, “Bum Ba Dee Da”, the contestants…er, suspects, went horseback riding along a trail on the estate grounds. A flock of birds startled the horses causing confusion. Then Ulysses’ horse trots forward, and he falls off. The ensuing investigation reveals that he was struck with two poison-coated nails–meant to suggest a snake bite. At the makeshift, outdoor morgue, Melina questions, “Not a single scratch?” She later states, “In all the morgue locations I’ve been to, this is the cleanest body I’ve ever seen.” Only Dana noticed the two puncture marks on his lower right calf. Now, here’s where I have a problem. The poisoned used was Oleander, a highly poisonous plant. We’re told the killer took flowers from the plant–conveniently growing by the stables–and used a mortal and pestle to grind out enough poison to coat the two finishing nails. I’m not saying it isn’t possible, but I’ve never heard of or read of a single case of oleander poisoning by injection. It’s nearly always ingested, or inhaled. About oleander, the book Deadly Doses: a Writer’s Guide to Poisons states, “All parts, including the nectar of the flowers, are poisonous, as well as smoke from the burning plant and the water in which the flowers are placed.” Using the twigs as skewers is also a bad idea. I imagine a filled syringe could inject enough of the poison and kill, but two coated nails? How could the killer coat the nails with a lethal dose? Not only that but wouldn’t some get wiped off as it passed through the pant leg of a pair of jeans and human skin? I’m no expert, but this seems dubious. Plus, the weapon is not found at the scene of the crime, but later stashed away in a shack. When did the killer have an opportunity to do that? Some have suggested on message boards that the killer forced Giles to remove it, but what if the weapon was never used? Now all this may seem pointless quibble if it weren’t for certain clues I’ve noticed. Clues to the killer’s identity have been few and far between on this show. The first real indicative clue came in Week Six when the contestants found a shoe print at the last known whereabouts of the two victims. It appeared to be a men’s size 13 shoe. Unfortunately, this clue gets tricky when Cris discovers padding in the shoe. There’s not a lot of padding, but it means someone with smaller feet–though I can’t imagine too much smaller–could have worn the shoes. I find myself wondering what shoe sizes each contestant wears. In Week Seven, the killer’s original plan was to strangle Geno, the tallest contestant, with a beaded lei. Not only is Geno tall, but he looks pretty strong. This suggests the killer must be equally fit and tall. Might this eliminate Cris, Melina, and Lindsey? Not only that, but the killer needed to employ night vision googles. Where did they come from and how would one of the guests retrieve them in the dark? Far easier for the killer to enter already wearing them. Additionally, the show’s website contains a section, “Clue Tracker”, with extra clues. Since the show started, the “killer” has also tweeted some clues. Perhaps, I’m reading too much into these, but I wonder if they’re meant for the viewer to ascertain subtle hints to the killer’s identity. 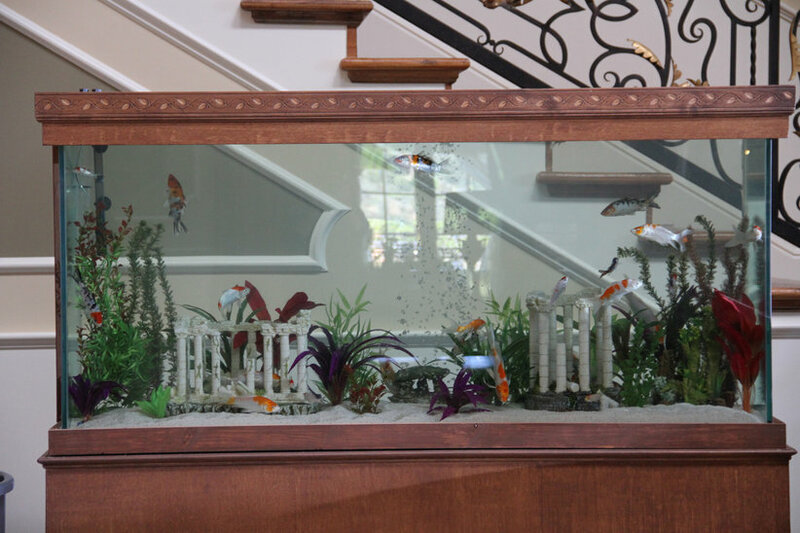 The aquarium was prominent during the champagne scene. Are the submerged temples the intended clue? A lot of people have been focusing on the Iron Maiden in the foyer as being out of place and a key clue, possibly related to the killer’s first tweet. But there was also something else in the foyer that, after the first episode, is no longer there. The aquarium. A closer look at the aquarium shows two submerged temples. One looks Greek, the other Roman. After Sheri’s death, the Roman columns are found broken next to her body. The killer frequently refers to the Rue Manor guests as mortals. This, and the temples would seem to indicate Ulysses, the only contestant with a name that directly ties into Greek and Roman Mythology. Ulysses is the Roman form of Odysseus, the famous voyager of The Odyessy. 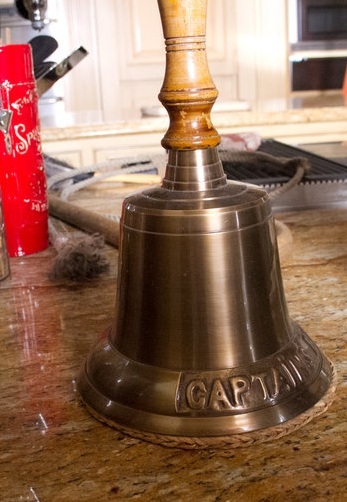 Then, in Week Four, among the additional clues posted to the show’s website, there was a curious shot of a bell on the kitchen counter. Eagle-eyed viewers might have seen it during the investigation of the scene of the crime. Up close, the word Captain visible on it. Ulysses was certainly the captain of his ship. In all honesty, I not exactly sure why I settled on Ulysses as my primary suspect after the first couple episodes, but he never seemed overly dramatic or antagonistic as several of the other contestants. He seemed a likely contender as killer, and the photo of the bell seemed like a significant clue. But then Ulysses got a scared card and fell off his horse. It seemed I was wrong until it was revealed that all of the horses, except one, were named for Greek gods! That can’t be coincidence. Greek names, horses… Is this suggestive of the most famous ploy in history, credited to Ulysses, the Trojan Horse? In his exit interview, Ulysses says, “Don’t trust anyone. Everyone is lying. Everyone.” Logically that means he is too. And why the seeming emphasis on the last word? So far, Ulysses is also the only guest with no shots of his body in the morgue. Not even a close up of the puncture marks on his leg. Under the Who’s Who section of the show’s website (click here) each of the “murdered” guests have an X over their portrait. But click on over and notice that the X over Ulysses’ portrait is a thick red, quite different from all the others. And “the killer” did not tweet during this episode. Why is this death so different, as one of the guests remarks? Why outdoors and away from the manor? Why isn’t it as gory as the others? In the Week Four, when Ulysses and Kam receive scared cards, Giles states, “I sincerely hope that your impending death will be as peaceful as this tranquilizer dart.” The butler stabs the dart into a steak. At the time, I thought this was related to Don’s murder, but maybe it was indicative of how one might fake their death. Week Six showcased a silent film that the Whodunnit? site identifies as being the 1910 original Frankenstein adaptation. The 1925 Phantom of the Opera would have been more appropriate to the episode, but the theme of Frankenstein is about bringing the dead back to life. Another clue? So I went back and rewatched the first episode. Remember the killer’s tweet, “REaD all the clues”? Ulysses is seen wearing a watch with a red band through much of episode one. Also, the killer states he killed Sheri, the first victim, because she broke her champagne glass. Ulysses was standing next to her. And finally, there’s yet another curious photo among the additional clues for Week One. There’s one view of the dining room with what looks like a focus on a particular chair. All the other additional clues for Week One related to the crime scene except this one (below, at left). This is the same chair Ulysses sat in at dinner that first night. (See photo at right.) Deliberate or coincidence? And might the St. Agatha medal, an important clue in Week Two, suggest a connection to Agatha Christie and a famous plot which surely inspired this show? Now, granted, all this may be an over-analyzed, misguided attempt on my part to make sense of this mystery show. I have to hope that there’s some logical explanation for who the killer is, and there are indeed clues–however subtle–that point to a particular person. Perhaps I’m focusing on the wrong set of clues (I’m sure I’ve missed plenty), but I’ve tried to see a pattern that suggests someone else and keep coming back to the solution above. As I stated before, if I had conceived this show as a mystery novel, this might be the ending I’d write. And I might, just might be correct. Two more episodes to go before we all find out whodunnit! Check out the ABC Whodunnit? website for more photos, clues, details, and even episodes. And for some behind the scenes details, check out this article. Please note: Comments may contain spoilers for those who haven’t seen all the episodes. Update: I see Ronnie has been X’ed out in the same fashion as Ulysses. This wasn’t the case BEFORE I posted my theory. Some new thoughts occur to me as I watched Week Eight. At the end of the episode, all four remaining guests are taken for a drive off the estate. When they return, Giles has been kidnapped and put in dire straits. How then could the killer have been one of the guests in the car? “Snakes, why did it have to be snakes?” The Indiana Jones connection to Ulysses’ death. Yes, I had encountered that connection on various message boards related to the show. Many were stating this indicated Kam was the killer because he had commented on the snake during that episode. But it still seems unnecessary for Ulysses to be dressed differently than the other “dead” guests unless there were some reason for it, which there didn’t appear to be. The use of “he” instead of “the killer” suggests a man, and further “I hid” would suggest Ulysses himself hid the snake making him the killer! Not to mention a snake bite isn’t what was supposed to have killed him in the first place. Ultimately, I’m disappointed. Not because I was wrong, but because the solution seemed so arbitrary. What were the clues, if any, that led to the killer’s identity?! Were there any? Does it simply come down to process of elimination? It would have made for a far better ending if when Kam and Cris were upstairs in the room watching Lindsey’s death for them to realize neither of them was the killer. After all, how cold either of them shoot the arrow that killed Lindsey if they’re both upstairs together? Alternatively, if the knight were mechanical when did the killer have time to set it up after they discovered Melina dead? At that point it would have been an awesome twist if the killer had been someone else. This would mean it could only have been Melina or Ulysses, the only two guests whose deaths could have been faked. In fact, it was at that point I wondered if perhaps Melina might be the killer. They never did examine her body that closely. And then when Lindsey was killed in the same room, it made me wonder. But no. Cris simply confesses. The fact that Cris never received a Scared card didn’t seem so anomalous. She seemed fairly good at solving the howdunnit of the murders. Plus were we ever told the killer couldn’t receive a Scared card? Also, it was awfully convenient that Cris found the vital clue to help her team solve Ulysses’ howdunnit. That caused the opposing team to lose two members, which left three vs. three. Then Cris solves the vital clue the following week, too? If this sequence of events hadn’t occurred, Cris might have ended up the only remaining member of her team and potentially raised the other player’s suspicions. It would seem there is a flaw in the show—perhaps one unanticipated—should the killer lack the means to solve the crime. The other players would quickly catch on to this. How else could the killer eek by eliminations if clues are withheld from him or her?